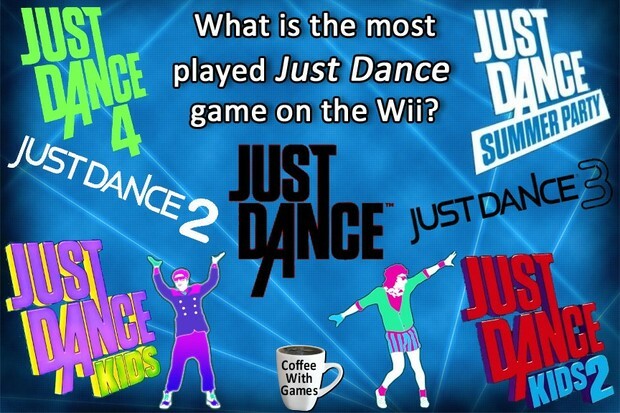 Community Blog by coffeewithgames // What is the most played Just Dance Wii game? What is the most played Just Dance Wii game? The first Just Dance game released on November 17, 2009 for the Nintendo Wii. The game did not receive a typical professional review score average that would make you think it would become one of the best selling Wii games, but apparently many consumers ignored the "professional reviews" and bought the original Just Dance in droves. It has sold millions of copies and its success helped form a new major franchise for Ubisoft, with at least one new game for the series each year, since the original released. Another Just Dance title is releasing this Tuesday, Just Dance: Disney Party. Which Just Dance game has become the Wii's most played "Per person" and also has the most total hours of gameplay reported, with so many titles for Wii owners to choose from? (Hint: It's not Just Dance 4.) Brew yourself some coffee, and let's take a look! 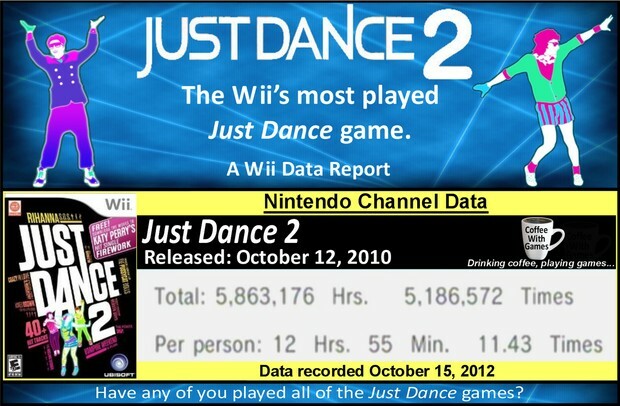 Just Dance 2 is the Wii's most played game from the Just Dance series, according to the average hours reported "Per person" and also the total hours reported on the Nintendo Channel for all of the Just Dance games. Just Dance 2 was released on October 12, 2010 with a MSRP of $39.99. The game was developed by Ubisoft Paris, and received an ESRB rating of "Everyone 10+" with "Lyrics, Mild Suggestive Themes" listed as content for gamers and parents to be aware of. The data shown in the image below is for the gameplay hours reported from U.S. Wii owners, with 734 days possibly reported. Just Dance 2 now has approximately 453,768 U.S. Wii owners that have reported playing the game through the Nintendo Channel, which is about 160,000 more Wii owners that have reported data for the game since last year's report. Just Dance 2's reported average play-time is 12 Hours 55 Minutes "Per person", with the average time played per day/session being about 1 Hour 7 Minutes. This means each time reported dancing session is lasting just over an hour. The game's reported average is 12 Hours 55 Minutes "Per person" as the image above shows. How has the game been received by critics and customers? The game has a "professional" critic review score average of 77.25%, based on 16 reviews on GameRankings.com. Just Dance 2 has a customer review score average of 90.22%, based on 1,097 reviews from Amazon.com. While I still have not played any of the Just Dance games, I have found it interesting to see the series continue to be so successful, and I enjoy seeing how Ubisoft has marketed the series and expanded it to the other consoles as well. Seeing Just Dance 2 being the most played game of the series on the Wii though, I do find interesting because it wasn't the first game in the series on the Wii. The 5,863,176 Total Hours reported for the game are equivalent to dancing for about 244,299 days, straight. That would be dancing 24 hours a day, 7 days a week, for just over 669 years. I think that would make for the longest "Just Sweat It Out" session! Just Dance 4 was just released on October 9th for the PlayStation 3, Wii, and Xbox 360. The Wii U is not yet out (less than a month now! ), but Just Dance 4 is scheduled to release 5 days before the system, on November 13th. 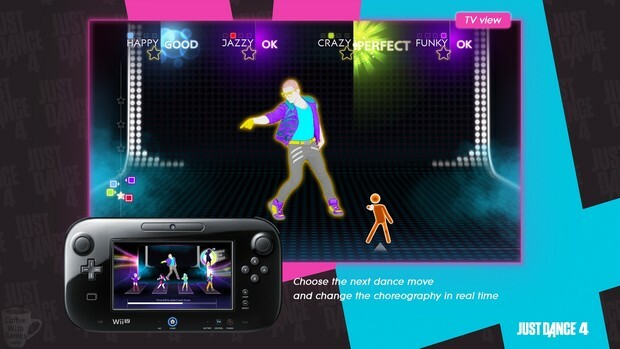 The trailer below is for Just Dance 4, and promotes how the Wii U GamePad's streaming function will work. Just Dance 4 on the Wii U currently has a MSRP of $49.99, which is $10 higher than the PlayStation 3, Wii, and Xbox 360 versions of the game. The game is releasing with three exclusive tracks for the Wii U version, as well as the Wii U exclusive Master of Ceremony and Puppet Master modes, and the ability to play Just Dance 4 off of just the Wii U GamePad. I just wonder if the $10 price difference is going to be adjusted before launch, and make a big difference for fans of the series; or if it will make for the first Just Dance title to release at $49.99, and perhaps future Just Dance games will continue to release at that price as well? Have any of you played Just Dance 2, and helped it become the Wii's most played Just Dance game in at least the U.S., passing the original? Have any of you played all of the Just Dance Wii games by any chance, and if so, do you have a favorite game from the series? If you're a fan of the Just Dance series and planning on buying a Wii U, do the extra Wii U modes in Just Dance 4 and the option to play off of just the Wii U GamePad make you likely to buy the game? I drink a lot of coffee, and often drink it while playing games. I enjoy FPS games and platforming games a great deal. GoldenEye 007 from the N64 is probably my favorite game ever. I enjoyed the first Red Steel on the Wii, a good bit. I am married, a father of two (three, counting the dog), and extremely fortunate to have a wife that not only doesn't mind me gaming, but enjoys gaming herself as well. I started a blog just over 3 years ago, CoffeeWithGames, covering a lot of Nintendo Wii titles, and how much those games are played. I broke the news about Nintendo stopping the shipping/printing of Metroid Prime Trilogy on the Wii, as well as a few other Wii titles. We own a Wii and PS3 as "current" generation consoles go. I just started gaming (a little) again on my PC in the last year, and am enjoying it as well. I have a Wii U Deluxe Set pre-ordered, and I am hoping Nintendo addresses a few remaining questions I have about the system, in the very near future.